Figure 1. Peak amygdala activation as a function of face trustworthiness for older adult participants. Error bars represent standard errors. COPE is the contrast of parameter estimates [high or medium, or low trustworthy faces minus baseline fixation] from which peak values were extracted at the subject-level using FSL featquery. * p < .05. There is a widespread belief that older adults are more vulnerable to consumer fraud than younger adults. Behavioral evidence supporting this belief is mixed, although there is a reliable tendency for older adults to view faces as more trustworthy than do younger adults. One study provided supporting neural evidence by demonstrating that older adults failed to show greater amygdala activation to low than high trustworthy faces, in contrast to considerable evidence that younger adults do show this effect. This result is consistent with the argument for greater vulnerability to fraud in older adults, since the amygdala responds to threatening stimuli. More generally, however, the amygdala responds to biologically salient stimuli, and many previous studies of younger adults have shown that this includes not only threatening, low trustworthy faces, but also high trustworthy faces. The Zebrowitz Face Perception Lab therefore included medium trustworthy faces in order to detect separate effects of high trustworthiness and low trustworthiness on amygdala activation in older adults, something that the one previous study of older adults did not do. Consistent with that study we found that older adults did not show stronger amygdala activation to low than high trustworthy faces. 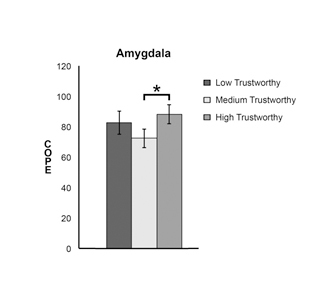 However, they did show stronger amygdala activation to high than to medium trustworthy faces, with a similar trend for low vs medium, although that difference was not strong enough to be confident that it would replicate (See Figure 1). The fact that older adults did not show greater amygdala activation to low than medium or high trustworthy faces is consistent with the suggestion that older adults may be more vulnerable to fraud. However, an important question is whether vigilant responding to untrustworthy-looking faces could actually protect one from fraud. Arguing against this possibility is the finding that although younger adults have consistently shown greater amygdala activation to people who look untrustworthy, they do not show greater activation to those who actually cheat. On the other hand, some evidence indicates that facial appearance does provide valid cues to threat. Face shape not only influenced younger adults’ trust of potential exploiters, but it also proved to be a valid indicator of economic exploitation. Furthermore, this face shape cue influenced both younger and older adults’ accurate impressions of aggressiveness. To shed further light on neural mechanisms for any age differences in vulnerability to fraud that may exist requires investigating: 1) the sensitivity of neural responses to actual differences in trustworthiness in the domain of economic exploitation, and 2) whether any age differences in those neural responses are related to differential vulnerability to economic exploitation. Zebrowitz, L.A., Ward, N., Boshyan, J., Gutchess, A., & Hadjikhani, N. (2017). Older adults’ neural activation in the reward circuit is sensitive to face trustworthiness. Cognitve, Affective, and Behavioral Neuroscience.